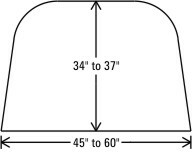 These are our most common sizes of standard basement window well grates. Typically used for metal wells or metal wells that have had concrete poured around the well such as a sidewalk or patio. please contact us for alternatives. Below, select the window well shape and interior size range that matches your window well. The model shown will be the grate your basement window well requires. 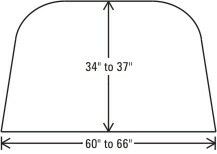 All dimensions listed are INSIDE measurements. Note: These grates are not intended for use on rectangular shaped wells if your well is rectangular – see the Rectangular Grates page. Adjust-A-Grates do not adjust front to back - the range indicated on the projection out is accommodated by properly positioning the grate inside your window well opening. These grates only adjust side to side within the given range. Not sure where to start or have a unique sized window well? Please contact us here, we’re happy to be of assistance.